Zoonoses are infections or diseases that can be transmitted directly or indirectly between animals and humans, for instance by consuming contaminated foodstuffs or through contact with infected animals. The severity of these diseases in humans varies from mild symptoms to life-threatening conditions. Research indicates that between one third and one half of all human infectious diseases have a zoonotic origin, that is, are transmitted from animals. About 75% of the new diseases that have affected humans over the past 10 years (such as the West Nile Virus) have originated from animals or products of animal origin. Food-borne zoonotic pathogens are transmitted through consumption of contaminated food or drinking water. Infectious agents in foodstuffs include bacteria such as Salmonella and Campylobacter, viruses such as norovirus or hepatitis A virus, and parasites such as Trichinella. The infectious agent which causes Bovine Spongiform Encephalopathy (BSE) in cattle can also be transmitted to humans through consumption of contaminated meat causing variant Creuzfeldt-Jakob disease. Unlike other food-borne diseases which are spread by microorganisms, BSE is caused by a prion, which is an abnormal form of a protein (known as PrPc). By vectors, i.e. living organisms that transmit infectious agents from an infected animal to a human or another animal. Vectors are frequently arthropods, such as mosquitoes, ticks, flies, fleas and lice and can transmit diseases such as malaria, West-Nile virus and Lyme disease. Avian influenza , which is a viral disease occurring in poultry and other birds. Pigs can also be carriers of this virus as well as of other influenza viruses. Avian influenza primarily affects birds, but there have been cases of viruses being transmitted to humans and other animals through close contact with infected birds. Q fever is a disease, caused by the Coxiela burnetti bacterium, affecting animals and humans. It has been reported to be present in a wide range of species, including cattle, sheep and goats as well as birds and arthropods. Human infection mainly results from the inhalation of dust contaminated with bacteria from the placenta and birth fluids or faeces from infected animals. Other modes of transmission, such as through contaminated water or the feces of infected arthropods are rare. A specific strain of the Meticillin-resistant Staphylococcus aureus (MRSA) bacterium (CC398) which can be transmitted through contact with live animals. Salmonella infections can originate from contact with infected reptiles and amphibians such as pet snakes, iguanas and frogs or their environment. Verotoxin-producing Escherichia coli (E. coli) can be acquired through contact with infected farm animals. These diseases can also be transmitted through the environment, e.g. Verotoxin-producing E. coli in contaminated swimming water. EFSA’s main role is to assess risks associated with the EU food chain, ensuring a high level of consumer protection and animal health. 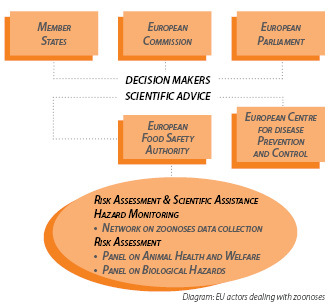 EFSA’s independent scientific advice and scientific assistance on the food safety and animal health-related aspects of zoonotic diseases supported by data collected in Member States help European decision-makers in setting policies and making decisions to protect consumers in the European Union. The occurrence of food-borne zoonoses in the EU is monitored and analysed annually by EFSA and the European Centre for Disease Prevention and Control (ECDC) to provide the Commission and the Member States with up-to-date information on the current situation. EU Member States collect comparable data on the prevalence of Salmonella, Campylobacter or other micro-organisms in food or animal populations, and send them to EFSA for analysis. EFSA and its Scientific Panels identify risk factors that contribute to the prevalence of zoonotic micro-organisms in animal populations based on Member State data and other relevant information. EFSA’s Scientific Panels carry out assessments of the risks for public health from infected animals and give advice about how new mitigation and control options will impact on these bacteria. The data collected by EU Member States serve as a basis for the EU to set targets for the reduction of these micro-organisms in food-producing animals and foodstuffs. EFSA’s scientific advice helps EU decision-makers to understand the anticipated public health impacts of different control measures. The impact of the reduction programmes on the actual prevalence of zoonoses in animals and foods and related human health cases are then monitored and analysed in the annual EU Summary Reports. Network on Zoonoses Data Collection: a pan-European network of national representatives of EU Member States and other reporting countries, as well as the World Health Organisation (WHO) and World Organisation for Animal Health (OIE). Members of the Network assist EFSA by gathering and sharing information on zoonoses in their respective countries. Panel on Biological Hazards and Panel on Animal Health and Welfare composed of independent experts carrying out risk assessments and providing scientific advice to EU risk managers on food-borne zoonoses.